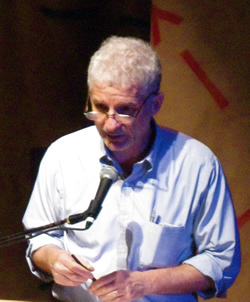 Daniel Menaker: How Do We Hear A New Voice? In a seminar devoted to New Voices, an interesting perspective was that belonging to Daniel Menaker, who for many years was a fiction editor at The New Yorker. His job was to find those new voices. He spoke warmly and knowledgeably about the challenge for fiction writers: “You must create an appetite for your writing in people who had no idea that they were hungry for it,” he said. “And to do that, there must be something new and different in your voice.” In this talk from the 2008 seminar, he spoke about how he recognized talented new writers, using as examples some early stories from now-established writers like George Saunders (“old new voices,” he called them). Menaker discusses the craft and the art of these stories in a talk that is technical but highly accessible. This recording is available for noncommercial and educational use only. All rights belong to the author. © 2008 Daniel Menaker. Used with permission from Daniel Menaker.